The agricultural use of manure as fertilizer has been an important component of agriculture since the beginnings of agriculture. China has a several-thousand year old tradition of recycling organic materials in agriculture (King 1911). Since the early-mid 1980s, however, there has been a steep decline in the recycling of crop residues, the growing of green manures, compost preparation, and the use of complex rotation techniques. High and unbalanced amounts of mineral fertilizers (mainly N) are being applied, while straw is frequently burnt on the field after harvest (Roelcke et al. 2005). In particular since the introduction of industrial scale animal production, traditional ways of reuse became difficult to apply. Large amounts of manure are produced at one location and the application over both space and time (particularly in winter), may become difficult. Though, from the perspective of an animal production plant, manure is of low value, new technologies such as anaerobic digestion, improved composting, and other forms of processing may offer new options of an economic and ecological use of manure. China slaughters currently nearly half (48.9% in 2009) auf the world’s pigs (FAOSTAT 2011). In 2011, about 30% of animal husbandry in China was carried out in large-scale operations, with increasing tendency. The mutual learning session will take place at a Pilot Pig Farm in Shunyi District of Beijing. Here, new technologies have been introduced in the last decades and comprehensive experience has been gained. King, F. H. (1911): Farmers of forty centuries or permanent agriculture in China, Korea and Japan. German translation of first edition (Madison, Wis., 1911), 1984. Georg E. Siebeneicher, Neu-Ulm and München. 208 pp. Roelcke, M.; Zhang, Y. S. & Li, S. X. (2005): Traditional manuring techniques in Chinese agriculture and their value for soil fertility and the ecosystem. In: Zhu, Z. L.; Minami, K. & Xing, G. X. (eds. ): Proceedings of the 3rd International Nitrogen Conference, Oct 12-16, 2004, Nanjing, China. pp. 339-347. Science Press, Beijing, Science Press, New York. Preliminary note: The following text comprises the orientations discussed and identified in the Mutual Learning 1.1) Moritz Engbers (PhD student Leuohana University, Germany) and Clemens Olbrich (MSc student, University of Oldenburg, Germany), facilitated this Dialogue Session of the 1st Global TraPs World Conference, July 18-20, 2013 and are responsible author of this summary. Seventeen people, 13 scienctists and 4 practitioners collaborated in this joint session . For further questions, please contact Prof. Ulli Vilsmaier, Leuphana University, Lüneburg (vilsmaier@leuphana.de) or Prof. Roland W. Scholz, Fraunhofer IGB (roland.scholz@emeritus.ethz.ch). Focus of the MLS 1.1 was to identify and discuss options to improve manure management from a sustainable phosphorus management perspective. It was partially merged with MLS 1.5 that focused on cropland management in vicinity of peri-urban industrial-scale animal husbandry operations. 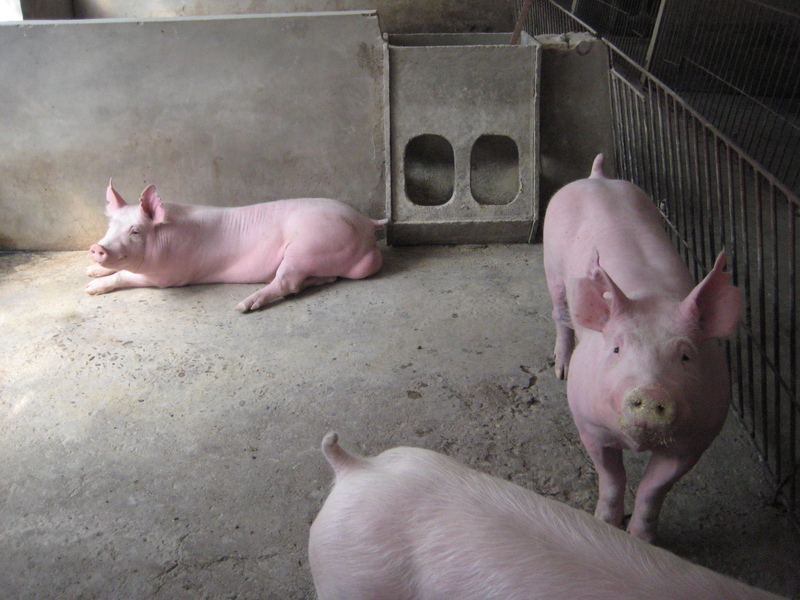 Therefore, both MLS 1.1 and 1.5 were jointly held at a Pilot Pig Farm in the Shunyi District of Beijing on June 18, 2013. The visit gave the opportunity to gain practical insights into a large-scale Chinese pig breeding and fattening farm with its biogas plant and composting facility. The different farm sectors, including adjacent small-scale cropland (“Ecological Feeding Gardens”), orchards and greenhouse-vegetables were also visited. Furthermore, there was an exchange of perspectives between the participants and the operators and technicians of the biogas and composting plants, as well as local farmers on manure management. The two MLS then split up for group discussions in the afternoon. Mineral phosphorus is a limited resource. Currently, there is no global systems analysis on phosphorus production and recycling through manure. The estimated amount worldwide is 22 Mt, with a loss of phosphorus in manure by 6-9 Mt due to inefficient use. A stronger integration of economic, environmental and animal production perspectives is therefore required. to discuss a follow-up process for the case. Important steps to optimize the phosphorus management on the pilot farm and comparable settings would be to increase soil testing and to find cheaper ways to analyze the nutrient content of manure. Therefore, the participation of local farmers and extension services is important. Further trainings and demonstration work (e.g. in cooperation with universities) would enable farmers to do their own soil testing and improve their knowledge on the amount of nutrients in manure. That would lead to a more efficient application of organic and mineral fertilizers. Furthermore, subsidies for conventional mineral fertilizers should be reduced and policies established to control the rate of nutrient applications.